Note: All photos are Copyright 1997 by John Farley. You may download them for your personal use, but any other use requires permission. Already early this morning, as I took my girlfriend to the St. Louis airport for a holiday visit to her parents, I knew it could be a chase day. By 8:00 a.m. the temperature was near 60 with a strong SSE wind and a strong cold front approaching from the northwest. A few thunderstorms had already blown up in the area and continued to do so to the west while we waited for her flight, and the early maps from TWC showed severe potential just to the southeast of the metro area. I commented that I wasn't sure whether after she left I would follow through on plans for my first day of skiing at Hidden Valley near Eureka, MO, or chase tornadoes. That choice was made quickly for me when I got home. Planning to check the forecasts on the Storm Chaser page, I took a quick look first at TWC and saw two lines of storms rapidly approaching from the southwest - one would pass southeast of the metro area, the other would move in behind it. No time to check internet reports; this stuff was moving in fast and required immediate action if I was going to go after it! Figuring I could always chase the trailing storms later, I decided to go after the leading storms - which would require an immediate departure in order to get ahead of them and view them from the east. I departed from my home in Edwardsville, Illinois (20 miles NE of downtown St. Louis, MO) around 11:00 a.m.. Ten minutes into the chase, the day's first tornado warning was issued for the tail-end storm in the leading line, then in Washington Co., MO. Ten minutes after that the whole area went under a tornado watch until 5:00 p.m. I got east a little on I-70, then headed south on IL 4 toward Mascoutah and Fayetteville. As I was headed this way, a T-storm warning was issued for a couple counties in Missouri, still well to my southwest. Before I reached I-64 (actually just north of Lebanon), I saw a wall cloud well to the west, which developed a smaller lowering just to its north - looked like a small funnel cloud, but I think it actually was some scud that formed just under the cloud base. Behind and north of this were some intense rain shafts. The smaller lowering merged with the larger one, and the entire feature disappeared in a few minutes, and I continued south. Shortly after noon, I was east of the tail-end storm, just south of Mascoutah, and got out to view and tape some small lowerings. There was also some CG lightning to the northeast, and two intense rain/hail shafts. After a while, however, the storm weakened and moved to the northeast, and I returned to Mascoutah for lunch. After lunch I entered a period of indecision - clearly the action was shifting to the trailing line, but it was not obvious where the main action would be. Severe T-storm warnings had been issued for a couple counties to the northwest of the St. Louis area, but there appeared to be a solid squall line there so I thought tornado development unlikely. I decided ultimately to head northwest on IL-15 toward I-255 (and toward the squall line) and would make a decision to go N or S once I got to 255. By now it was around 1:30. As I got within a few miles of I-255, a tornado warning went up again (until 2:15) for Washington Co, MO, with a radar-indicated tornadic storm heading toward Potosi. (This turned out to be the first of 3 tornado warnings on this storm.) I was now very close to leading edge of the squall line, and knew I had to get back to the southeast if I had any chance of intercepting the storm reported as tornadic. I returned back to IL 4 and headed south, eventually turning west for a better view of the storm (still in a solid line to my west) south of Freeburg. Tornado warnings were now up for Ste. Genevieve Co. MO, about 25 miles SW of my current location, until 2:45. Both warnings issued up to this point indicated the tornadic storm moving NE at about 40 mph. If I continued further south, I should be able to get southeast of it for a good view, if it wasn't rain-wrapped. To my W and NW, there was a solid unbroken squall line with a continuous shelf cloud, but occasional pockets of anvil rain would obscure parts of the approaching line off to my southwest. 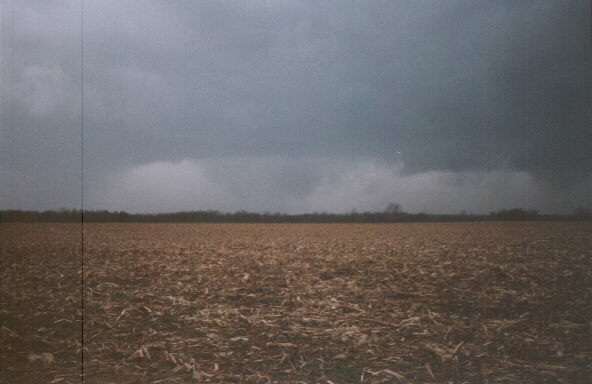 As I continued south, now on IL 159, I noticed a very dark area to the southwest, with an obvious updraft tower above. But parts of the base were obscured by rain. I continued south, occasionally turning off for a better view. At 2:45, when I was around Red Bud, a tornado warning went up for northern Randolph Co, IL, effective until 3:15. Two miles back I had crossed into Randolph Co. from the north! The radar-indicated tornadic storm was now moving ENE at 40, indicating that it was starting to turn to the right. The warning indicated that the town of Prarie du Rocher was in the storm's path. I adjusted my planned viewing stop southward for this new direction of movement, and stopped on a small side road about halfway between Ruma and Evansville - almost due east of Prarie Du Rocher. This stop was just off IL 3, which merges with 159 in Red Bud. To what I believed to be the WNW of my location, there were two large cloud lowerings, one to the left and one to the right, with a fair amount of CG around them and to the northeast. (Actually, though, the lowerings were probably to my SW, because the highway (now IL 3) curves to the southeast at Ruma. Failure to keep track of this was a key error that would ultimately get me in a ticklish situation! A careful review later of maps of the area revealed that the side road I stopped at, which I thought went W, actually went S!) There was also a dark area to the southeast of the lowerings which appeared to be a rain curtain. Both lowerings at first reached about halfway to the ground; I could not tell whether or not they were rotating. The one to the left, which was wider, eventually reached about two thirds of the way to the ground. Then a third lowering formed between the two, somewhat narrower and rounded at the bottom. It also reached at least halfway to the ground. I watched, shot photos, and videotaped. (Later note - the video shows what could be small funnels or vortices briefly protruding from both the center and left lowerings.) As the CG was getting closer, I did the latter part of my photography from inside the car, through an open window. 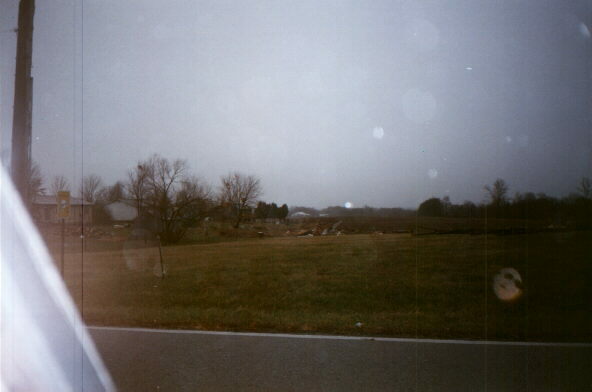 I could not see if there was any debris near the ground, due to poor visibility and a tree line in the distance. I viewed the formations described above for about 5-10 minutes. Then, suddenly it dawned on me that the storm was turning to the right again, and this whole mess was coming right at me! (Later note: although the storm did turn slightly to the right of its predicted movement toward Prarie Du Rocher, its movement surprised me mainly because I had become confused about which direction I was facing.) I decided to beat a hasty retreat to what I thought was the south (but actually was SE) on IL 3. About a mile ahead, I saw a flashing blue light at the side of the road which I thought at first was a police car but in fact was a spotter. As I approached, he made the same decision I had and went into retreat mode, just ahead of me. Now the rain curtains to my south or SSW were getting very close and very dark. I realized that either the lowerings I had watched or whatever might lurk behind the rain curtain could be a real threat to me in this location. I was not sure I could get south before the rain curtains crossed the highway, and did not want to inadvertently core punch. When the spotter turned left I figured there was an east option and I would go the same way and try to outrun the storm. But the road turned and went right into the town of Evansville! As the spotter and I made our way through the town, the rain and wind closed in, and a few chunks of golfball hail banged on the roof of my car. I had visions of a rain-wrapped tornado behind the core, hitting the town with me in it! [There is a real lesson here about getting too entranced with the storm to retreat as soon as one ought to, and about keeping track of curvy roads that can get you confused on direction!] The road through town had curved various directions, but the sharpest turns were to the right, leading me to think I was now going south. I wasn't, so for a second time I was confused about direction; I was actually going east. But as the wind and hail pummeled the town, I saw brighter sky ahead and figured I could get south of the storm's path. 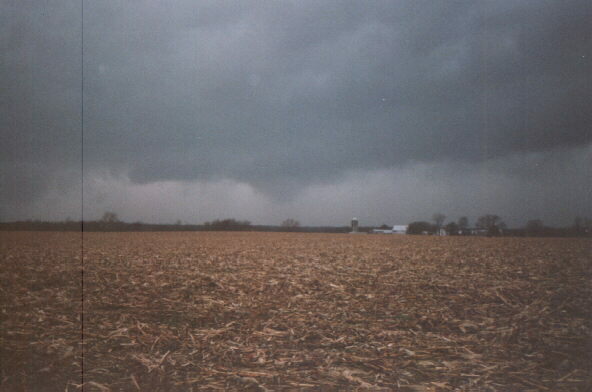 At the edge of the town, the spotter turned off and stopped; I kept going to get out of the storm's path. (This turned out be be a VERY good decision, despite my confusion about directions. I am not sure of the exact time, but it had to be very close to 3:00 p.m.) I quickly got out of the large hail (there never were more than a few chunks), but continued in rain, wind, and occasional small hail for about 6-10 miles. As I saw new rain curtains closing in just ahead of me, I noticed the sky behind me getting brighter, so I made a decision: I stopped and turned around and went back toward the town. In retrospect, as noted above, it turns out the road I was on went east not south. I had again been confused by the curviness of the road in the town, and was probably less observant than normal due to my frantic rush to escape the storm. As a result of this misjudgment, I was trying to outrun the storm to the east, which was in a line that continued southwestward beyond the cell reported as tornadic. And it was just moving too fast to outrun on a narrow road in lousy conditions. So stopping and going back was a good decision; the intensity of the rain and wind decreased rather quickly. As I approached the town again, I saw flashing lights. Had it in fact been hit by a tornado? As I approached closer, I noticed a small tree down on the left side of the road and small branches in the road - then a field to my right full of debris! (These photos are somewhat underexposed, so turn up your brightness.) As I approached a little closer, an incredible scene unfolded before my eyes. The road was totally blocked by fallen telephone lines and poles, and on the right side of the road, two very large trees were broken off near ground level. A house had the wall of its garage, on its south side, crushed inward, and pieces of the overhang of the house next door (to its S, at the corner with the road I was on) were missing. (Note: Out of courtesy to the people who suffered property damage, no photos showing damage to homes will be posted.) Downwind of the houses, a tree was completely filled with debris, much of which appeared to be insulation blown from a house or other building. I stopped at the roadblock and took a few very quick pictures, then turned around quickly and returned south to find an alternate route and stay out of the way of rescue and emergency operations. I did notice the spotter I had followed there earlier assisting the law enforcement officials, so he was OK despite having stopped very close to the storm's path. I tried one detour, but went in a circle on a back road and ended up back at the same spot. On this second passing I noticed that a stack of firewood logs behind one of the damaged houses had been scattered by the storm. There appeared to be other damage further back from the main road, but it was obstructed by buildings and fallen trees. I found a better detour route this time circling to the east and north. In the course of this, I noticed debris, mostly the same as what was in the tree, a half-mile to one mile downwind from the houses that had been hit. On the way back, I heard news reports indicating that siding had been damaged on one house and several houses unroofed in Evansville by high winds around 3:00 p.m. Fortunately, there were no injuries. It was not clear from these reports whether the damage was from a tornado or from straight line winds, though the narrow, intense (though short) damage path leads me to believe that the former is a good possibility. (Later note: It has now been confirmed by an NWS damage survey that this was an F1 tornado. See end of this report for details.) I cannot say for sure whether it came from one of the lowerings I saw or from something in or behind the rain and hail curtain I had observed to the east of the lowerings. Based on the direction of the damage path (WSW to ENE), I was initially inclined to think the latter was more likely. But after careful review of the maps and determination of the direction I was facing when I saw the lowerings, it would appear that the lowerings would have been to the WSW of Evansville when I saw them. Thus, I think that one of them was the source of the tornado. But whatever the source of it was, it did considerable damage in a small area on the east side of the town. And it must have hit moments after I passed through - a close call that taught me a valuable lesson about keeping track of direction on curvy roads! One other thought - this was my third serious chase (plus a couple very impropmtu ones, over the past 2 years) and I realize now there is no substitute for experience. I knew from reading, videos, and the internet what was dangerous, and when I was in fact in the path of the storm I knew I was in a very dangerous situation - and believe me, I was appropriately scared! But none of this knowledge kept me from making mistakes about navigation and the storm's direction of movement, even though I did know I needed to get out of there fast when I was actually in the direct path of the storm. Next time I will be farther to the right of the storm's path, more aware of changing road directions, and more alert to changes in the storm's movement and development. I also have a better appreciation of why chasers are hesitant to chase tornadic storms in squall lines. More info: 10:00 p.m. St. Louis newscasts, one with live footage from Evansville, reported 16 homes damaged and one (just to the north of the ones I had seen damaged) uninhabitable. An eyewitness reported seeing a tree flying through the air over a cemetary at treetop height, across the road from the homes that were damaged. 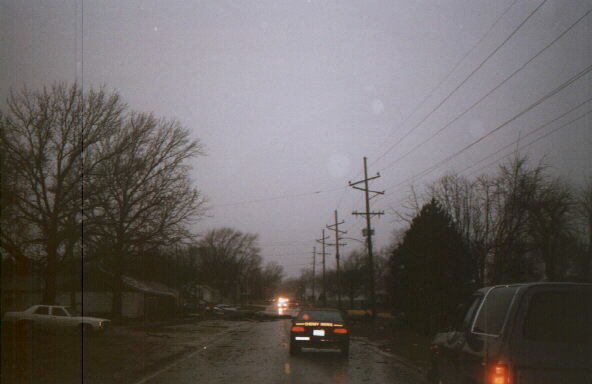 Newspaper and TV reports the next day indicated that NWS was conducting a damage survey to determine if the storm was a tornado. The tornado initially touched down 1/2 mile southwest of Evansville at 2:55 pm and caused F0 to F1 damage to 2 homes and one large utility building. Several large trees were also uprooted. A nearby church sustained minor roof damage. The tornado moved across the southern end of town causing mainly tree damage. Two mobile homes near the southeast end of town sustained roof damage. This damage was all F0. 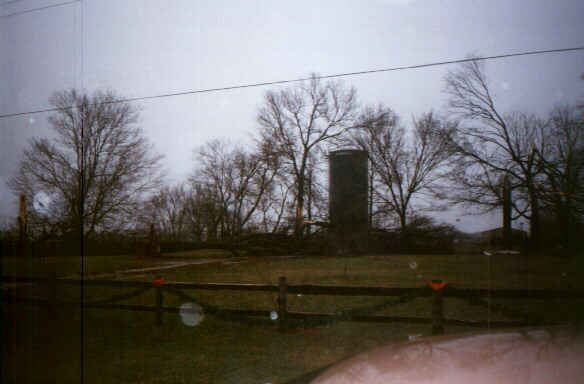 The tornado continued northeast, destroying the town's bowling alley, a nearby large utility building and barn. Nearly all the south half of the bowling alley was completely gone. The tornado crossed Shuline Road and damaged 3 homes. One had minor damage, a second lost half its roof, and the third had its entire roof lifted off. Primarily F1 damage. 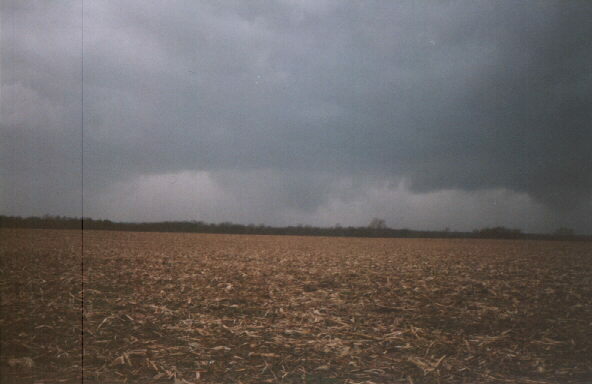 The tornado continued east-northeast for about another mile through open farm land. Total track was about 2 miles with the damage path from 50 to 70 yards wide. 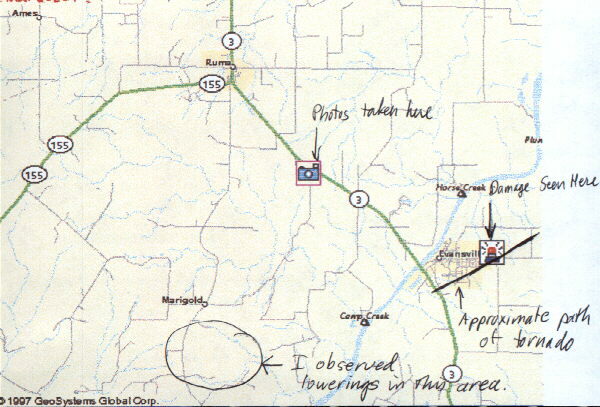 ADDED JANUARY 28, 1997: A Mapquest map showing the tornado's damage path, the location from which I photographed the storm, and the approximate location of the cloud lowerings I photographed. OR INTERIOR ROOM ON THE LOWEST LEVEL. WILL MOVE THROUGH THE BLOOMSDALE...PRARIE DU ROCHER AND RENAULT. Thanks to the Central Atlantic Storm Investigators for posting these warnings in their tornado warning archive.